Description: This is a spring surimono originally created in 1832, which - as one would assume from the image - was a 'dragon' year. It was designed by Totoya Hokkei, one of Hokusai's followers, who is said to have left designs for more than 1000 such surimono. Not clearly visible in the photograph of the original above are the 'special effects' commonly used in such prints: the silver and gold (coloured) metallic pigments, the deep embossing of the calligraphy and other patterns, and the full 'body' of the thick hosho paper. 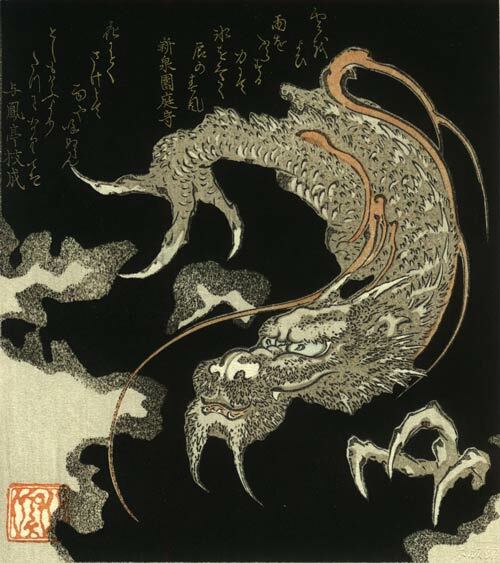 The Mokuhankan edition of this print is intended to match the original as closely as possible. A series of postings and discussions on the Conversations section of this website covers the creation of this print, from tracing the original through to printing the edition.